On tonight’s show Jessie Weiner a children’s rights advocate from Florida brings her experience fighting for family court reform to the Saving Fatherhood Podcast. Jessie works in child psychology. Her undergraduate degree is in psychology. She has a masters in social work. 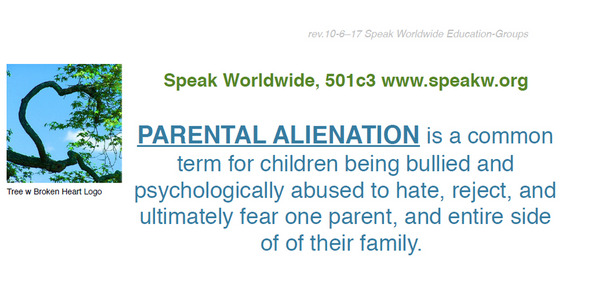 Parental alienation has been her life as a child as well. She is an alienated child. You’ll rarely meet an advocate with as much passion. I hope you enjoy this podcast. Why children should have equal access to both parents.. The importance of children growing up with both parents. How Title IV-D of the Social Security Administration is keeping our children from their parents. The need for reform and what reform should look like. My Kid’s Right – Our guests page. Title IV-D Report discussed on the Podcast. IMPORTANT NOTE: If you are struggling emotionally, and feel you are going down a dark road, don’t be ashamed! We recommend always having the National Suicide Prevention Hotline 1-800-273-8255 and website https://suicidepreventionlifeline.org at your side. Many of us have been there too. Copy and save this! The NEXT Burlington County SpeakW Parental Alienation Support Group is this Monday November 19th. If you know anyone in South Jersey or the Greater Philadelphia Area please have them contact me at JoeG@SavingFatherhood.org. If you are a New Jersey registered voter please use this link to send letters to your state representatives and ask them to support the 50/50 shared parenting bill that can prevent several types of parental alienation. More importantly children deserve the two parents God gave them no matter how we judge those people. Be the first to comment on "19 My Kids Right! – Jessie Weiner"